I’ve been working with nutritionist/acupuncturist Olivia Honeycutt at Merritt Wellness for a while now. 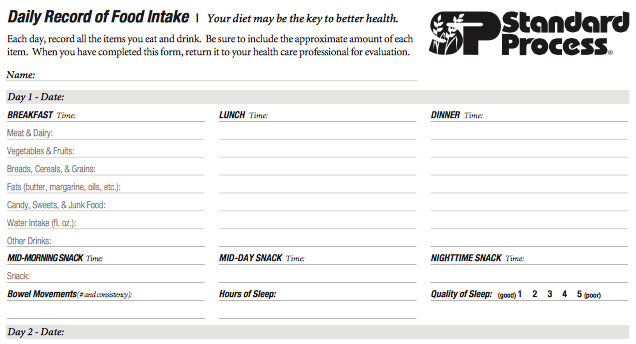 One of the tools Olivia gives her clients is the Standard Process Daily Record of Food Intake form. I’ve been working with local clinical nutritionist/acupuncturist Olivia Honeycutt for a couple of months, tweaking my diet so I can be healthier and have more energy. She gave me some forms for noting what I eat for meals and snacks, when I eat, how much water I drink, how many hours of sleep I get and the quality of my sleep, bowel movements, etc. We get together every couple of weeks so I can share my forms. She looks them over and makes recommendations of little tweaks I can make to improve my health through diet. Although I was already eating very little grains and legumes and no gluten before I started working with Olivia, I’m eating more of a traditional diet now. Yet here I am, eating butter, ghee, and/or bacon grease daily. I did not want to gain weight, but I have. It’s actually fat turned to muscle, because my clothes still fit. To lose weight eating like this, you eat more fat earlier in the day. The great thing about fat is that it satisfies. If I’m working for hours doing massage, and I don’t have time to eat, consuming fat will stave off my hunger for longer than anything else I could eat. It’s fuel. I’ve tried eating various fat-laden foods such as almond butter, coconut butter, Epic bison/lamb/turkey/beef bars, avocados, and some organic extra-virgin coconut oil when my hunger is getting the better of me. It works. One of the biggest adjustments is that from tracking my water intake, I learned I wasn’t drinking enough water. Now I drink 16 ounces upon arising (with a tablespoon of apple cider vinegar). My water bottle holds 27 ounces, and I empty it daily. Another 16 ounces in the evening brings my total to 59 ounces, close enough to my goal of 60 ounces a day, or about half my body weight in ounces. I don’t count the caffeinated tea I drink because tea is a diuretic. Also, I like to drink a glass of water about 10 minutes before eating because it helps me avoid overeating. It’s so easy to confuse hunger and thirst! When my thirst is sated, I’m not as hungry. I don’t eat much canned or processed foods, except for sardines. I eat raw honey, rare beef, and fermented food and drink such as sauerkraut, refrigerator pickles, yogurt, kefir, kombucha, Kevita, wine, cider, or cheese nearly every day. I’m learning to soak and dehydrate nuts. (Well, just walnuts, so far.) The cookbook Nourishing Traditions has been helpful. This diet is similar to the Paleo diet, is influenced by the Weston A. Price Foundation‘s dietary principles, and also by Olivia’s understanding of diet and health from her acupuncture training (having to do with heat, cold, dampness, herbs, seasons, constitutions, etc.). I try to eat half a beet and drink a cup of dandelion tea (leaf or root) each day for better liver function. I eat dark green leafy vegetables, cruciferous vegetables, and tropical fruits. And high-cacao chocolate (over 70 percent). I also make bone broths, especially in the winter, for the calcium. I save chicken, beef, and lamb bones and veggie scraps in my freezer. Sometimes I just buy bones. I have a big plastic container to store them in, and I also add the water from steaming veggies to this frozen stockpile of nutrients. When I’ve got enough, I put the contents into a stockpot, add water to cover and a splash of apple cider vinegar and a moderate amount of salt, and cook it at a simmer for a day or two, skimming foam off the top when it first rises. The resulting broth is flavorful and extremely nourishing. I drink a cup a day when I have it and also use it as a basis for soups and stews. See my post on making turkey vegetable soup with bone broth! In summer (because it’s too hot to make broth), and when I’ve run out of broth, I consume a tablespoon of gelatin every day for the protein. It thickens smoothies, makes my hair and nails grow thicker and faster, and is good for joints and reducing cellulite. I get the Great Lakes brand sold on Amazon. My gut seems to be working better despite recent stressful difficulties. I take L-glutamine supplements, which help with gut issues and have many other benefits. Check out my Products I Recommend page for more recommendations for books, supplements, and products to improve your well-being.